Orthokeratology, also known as OrthoK, is the process of using custom gas permeable contact lenses to gently reshape your cornea while you sleep. This treatment temporarily changes your prescription to eliminate your need for eyeglasses or contact lenses during the day. Since the treatment works while you sleep, all you have to do is remove your lenses in the morning and enjoy up to 20/20 vision all day long! OrthoK has other great benefits including the potential to slow the progression of myopia. If you have a young child who is already myopic, orthokeratology could be extremely beneficial in reducing the extent of further increases in myopia. Before and after OrthoK (left) and resultant effect (right). During your orthokeratology evaluation, Dr. Rebarchik will determine if you are a good candidate for the treatment. He will ask you pertinent questions and perform specialized imaging of the front of your eyes known as corneal topography. The information generated creates a topographical map detailing the shape of your corneas. 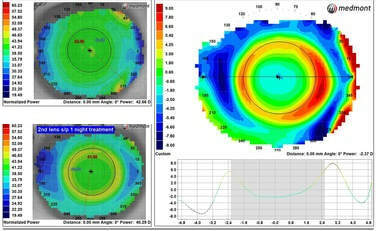 This information is then combined with your prescription to custom design specialty ortho-k lenses unique to your eyes. Once the lenses arrive you will be instructed on how to insert and remove them as well as proper care and maintenance to avoid complications. After your first night of wear Dr. Rebarchik will evaluate the initial treatment effect the following morning. Typically, full treatment effect is reached within one week, however your orthokeratology effect may take more or less time. Dr. Rebarchik will frequently evaluate you to determine your progress and make any necessary changes to your lens design to ensure your best possible outcome. After a successful treatment outcome you will be place on a maintenance program and typically followed by Dr. Rebarchik at six-month intervals. These visits are crucial to your continued success in both maintaining maximal refractive outcome and safety of the treatment. Think orthokeratology may be right for you or your child? Call our Lewes office to schedule a consultation with Dr. Rebarchik or email Dr. Rebarchik any questions.